Always on the look out for a new homemade project, and perhaps inspired by the episodes of MasterChef Australia that my flatmate is so fond of, I decided to embark on my first sous-vide project: a simple fruit infused syrup. Sous-vide (literally ‘under vacuum’) refers to a method of sealing food in an airtight bag and cooking it in a water bath. The overall process allows the food to cook evenly, with the bag ensuring that as much flavour as possible is kept in. The water bath makes it easier to regulate the temperature – keeping it constant and at a precise temperature for a long period of time. Sous-vide cooking has been used in high-end restaurants since the 1960s, and celebrity chefs and TV cookery programmes have raised its profile in recent years. Behind the scenes, a number of bars have also discovered that the process works better than simple maceration insofar as it allows the liquid to fully adsorb the whole flavour of the fruit, avoiding the bitter or musty flavours that can be created as the fruit is broken down. A starter sous-vide machine will retail for around £250, but fortunately there is a quick and easy way to reproduce the effect with reasonable results in your own kitchen. I decided to make 250ml of raspberry syrup as a first attempt. First I bought a box of medium sandwich bags – these were probably a bit larger than necessary for the quantities that I will be making, but the added size does make it easier to add and remove the ingredients without spillage, and at least I’ll be all set up if I decide to go into industrial production in the future! To make the raspberry syrup I put 170g of fresh raspberries, 190g of white sugar and 240ml of cold water into a bag. I sealed the bag, and squeezed out the air to create a vacuum. I then moved to the hob to construct a basic bain-marie by placing a small saucepan of water inside a large saucepan of water. When constructing this it helps to use pans that nest together evenly (I didn’t!) and to remember Archimedes’ principle (I didn’t!). The aim is to have the smaller pan about half submerged in water in the larger pan. Heat the water until the top pan has reached a steady temperature of 57°C. This will require a fairly accurate thermometer and I found that mine didn’t enjoy long exposure to the high temperatures. Once the water has reached the required temperature, place the bag of ingredients into the smaller pan and cook for 30 minutes. 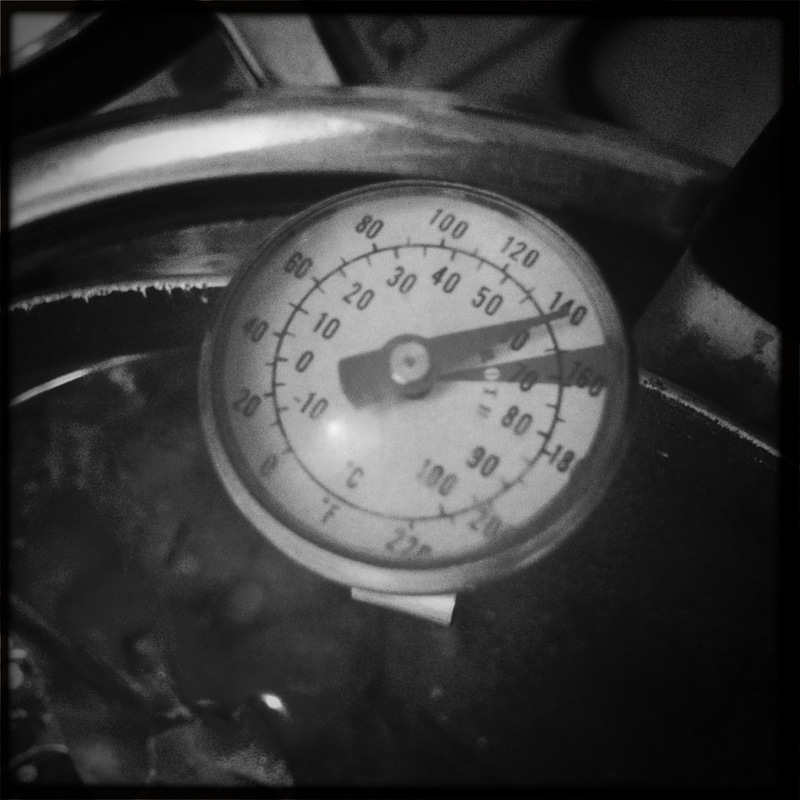 Try to maintain the steady temperature throughout the cooking time. This may be easier said than done, but I managed to stay within a range of a few degrees. Once the cooking time has elapsed remove the bag from the pan and allow it to cool briefly. During this cooling time, prepare an ice bath by filling a container with cold water and a handful of ice cubes. Place the bag (still sealed) in the ice bath for approximately ten minutes. Meanwhile sterilise a jar or bottle and once the syrup has cooled, fine strain it into the container, and add about 10ml of vodka to extend its shelf-life. The syrup should be kept refrigerated and will keep for 2-3 weeks. Photo courtesy of StuartWebster, some rights reserved. All celebrations are special, but for a really special celebration (perhaps a Princess’s birthday?) something quite exquisite is required. I’ve never really understood what makes a French Martini a Martini, because apart from the glass they are nothing alike, but the addition of Champagne certainly makes this French Martini even more French. The ever-so simple but effective French-Martini.com explains that originally a French Martini was just a Martini made with a French vermouth, which makes literal sense, although apart from national pride (thank you, L’Académie Française!) perhaps doesn’t warrant the naming of a whole new drink. 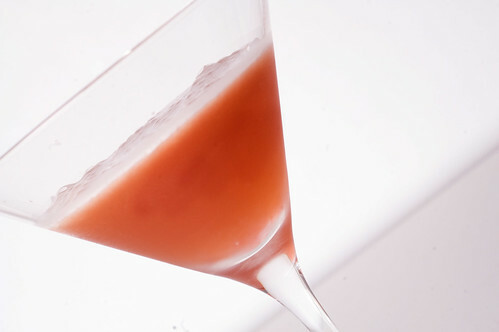 As a result, therefore, we can only assume that the French Martini as we now know it was developed for those who cannot face the prospect of a genuine Martini just yet, but want to pretend they’re enjoying a distant relative of the drink enjoyed by those embodiments of suave, Humphrey Bogart and Mae West. Of course the French Martini is a variant of the Martini in the loosest possible sense, as it contains neither of the ingredients of a traditional Martini, and unlike its namesake is fruity, crisp and super-sweet in equal measure. Add a measure of vanilla vodka, 2/3 measure of Chambord black raspberry liqueur and 1/2 measure of pineapple juice to a shaker of ice. Shake well and strain into a martini glass (also works well in tea cups, jam jars and plant pots). Top up with Champagne and garnish with a raspberries.